J.J. Abrams continues his rise to power with this rebooting of Star Trek that will leave most Trekkies with big goofy grins on their faces. This film goes right back to the beginning, to the very birth of James Tiberius Kirk in order to lay out the groundwork for any future sequels, and does it pretty darn well. Firstly, the positives: Characterisation. Writers Alex Kurtzman and Roberto Orci have truly done justice to the core crew of the U.S.S. Enterprise. 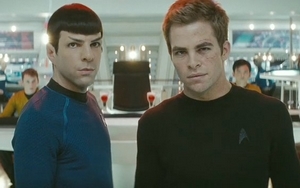 At the forefront are of course Kirk (Chris Pine) and Spock (Zachary Quinto), and every second they spend together in this film is perfect. Constantly at loggerheads, their differing viewpoints are conceptualised perfectly and their rivalry is what makes this film so enjoyable. I’ve seen all the Star Trek films (though little of the original series to be honest), and it’s only now that I get Kirk. He’s brash and foolhardy and thinks way too highly of himself, but that’s why we like him. Being such a ‘Green Lantern’ fan, I was also a little concerned that his character was a little too similar to that of Hal Jordan in the upcoming comic adaptation, but I have way too many anxieties over that film’s potential to be adding another into the mix. The bad: the central plot. It’s awful, makes very little sense, relying on coincidence and shady motives, and more importantly involves time travel. I’ve always found that Star Trek writers slip into time travel mode when they’re feeling lazy. It’s uninteresting and feels like a cheat. Moreover, it’s incredibly confusing in this film – not in an “oooh-it’s-screwing-with-my-head Primer” kind of way, but in a – “huh… this makes no sense whatsoever” way. The special effects are passable. Nothing looks very real, but that’s likely to occur when everything onscreen is CGI – bring back miniatures, I say… Trekkies will notice the uniforms, spaceships etcetera honour the old ones but with small changes here and there. The action (as well as the bare flesh) has been turned up a notch, though they take the transporting to such extremes it’s hard to understand where they could go in future instalments. The film can’t help but seem like a pilot episode for a television show, but that’s probably cos of the nature of the franchise, and the fact that the sequel has been greenlit already. The depth of character on show is the most impressive aspect of Star Trek – almost up there with Batman Begins, it’s just such a pity the main narrative is both unnecessarily confusing and totally uninteresting. Overall it’s profoundly entertaining, and will probably reel in a whole new audience unacquainted with the Star Trek phenomenon. If the noughties are to be remembered for anything in terms of the output of the big Hollywood studios, it is likely the concept of the franchise reboot. Like Batman Begins and several other films that seek to re-envision the origins of their heroes, Star Trek focusses more on character than action, with conflict at a personal and inter-personal level favoured before the inter-planetary. The good news is that this mostly works. When a Romulan ship arrives through a black hole and attacks the starship carrying George Kirk, he is faced with the toughest decision of all, and yet true to tradition he decides to crash his ship into the alien craft to save the lives of the rest of the crew – including his wife who is in labour at just that moment. The birth of their son James will be his reward, and his father’s death James’ curse. Many years later, after being ‘discovered’ in a bar brawl with new recruits, James T. Kirk will decide to follow his father into the Starfleet, a decision that just may save the human race. The first half of Star Trek is wonderful – to introduce characters so well known to fans and non-fans alike, and yet make them seem fresh and interesting, is no small feat. Kirk, Spock, Bones and Uhara all benefit from backstory that makes their individual motivations and interactions all the more rich as the film progresses. Chekov and Sulu are given less to do, although both become stronger characters in the latter stages. The cast is made up of no ‘name’ performers, with the small splash made by Karl Urban in the The Lord of the Rings trilogy seeming like another lifetime, and Harold & Kumar Go to White Castle the biggest hit for John Cho. The most recent success from this cast would be the role of Sylar Zachary Quinto plays in ‘Heroes’. Given their relative obscurity, a lot rests on the shoulders of Chris Pine as Kirk and Quinto as Spock, and neither lets himself down. Quinto is menacing and yet reserved, although he is perhaps allowed more emotional leeway than Leonard Nimoy in the original series. Pine has a role many would kill for – the chance to bring Captain James T. Kirk to life once more, but this time with more explanation for his particular approach to problem solving. That the film gets too wrapped up in the consequences of time-travel and fortunate coincidences to maintain the momentum it generates in its first half is a shame, as the effort spent establishing character and setting deserves more than to be squandered in this way. The large-scale action set-pieces are far less interesting than the character work, and are often plagued by – now-typical – shoddy editing. CGI can be intrusive, although Abrams’ decision to recycle the monster footage he created for Cloverfield and just change the background must have saved the production a lot of dough. Abrams seems to have been determined to honour the legacy of the television series and films set in this world, and deliberately includes several winks or nods to attentive fans of the franchise. Occasionally, this can come off as being too ‘pally’ with the audience, and may intrude on the sense of the reality of the events on screen. The temptation to ‘talk’ directly to the fans should never be allowed to interrupt the flow in this manner, and this is an unfortunate mistake on Abrams’ part. No film attempting to remake beloved characters and stories in another era can hope to satisfy everyone, but Star Trek must be considered one of the more successful in its attempt. One hopes the next in the series can capitalise on the strengths of this film while avoiding its mistakes.